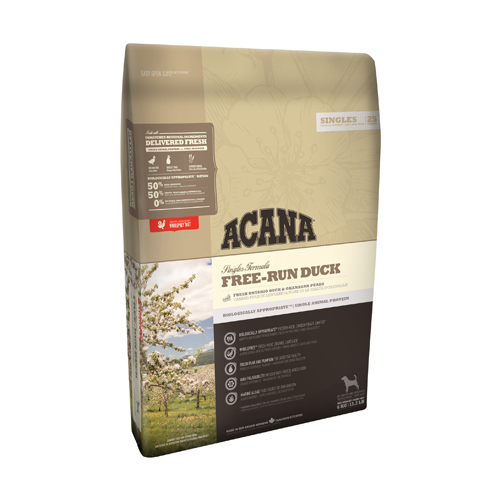 Free-Run Duck from Acana is a dry food containing duck as the only protein source. That makes this food suitable for dogs with a food allergy or intolerance as well. Acana Singles Free-Run Duck is suitable for dogs of all breeds and ages. Acana Singles are produced with a single source of protein, supplemented with a small amount of fruit, vegetables and herbs. In addition, the Singles mainly consist of nutrients that are naturally available in the ingredients. The artificial additives are reduced to a minimum. Free-Run Duck from Acana consists of 50% duck meat. The pears and pumpkin in this dry food support your dog's digestive system. This food is suitable for dogs of all breeds and ages. Acana makes its natural animal food from local products. The evolution of dogs is taken into account when selecting the ingredients. Historically, their food consisted of fresh meat and was rich in protein. The ingredients are locally sourced (Alberta, Canada). Acana Biologically Appropriate is prepared with fresh meat, fresh fish, vegetables, fruit and herbs based on your dog's needs. Biologically Appropriate animal food consists mostly of fresh ingredients. Another facet of Biologically Appropriate is that the food is adapted to suit the animal's digestive system. This is why the products are free of aromas, colourings, flavourings and other additives and are free from GMO (Genetically Modified Organisms) and antibiotics. Fresh duck (18%), duck meat meal (17%), whole green peas, whole red lentils, duck liver + duck heart + duck kidney (7%), duck fat (6%), fresh pears (4%), whole chickpeas, green lentils, yellow peas, dried duck cartilage (2%), lentil fibres, marine algae (1.2%), pumpkin, brown seaweed, freeze-dried duck liver (0.1%), salt, fresh whole cranberries, fresh whole blueberries, chicory root, turmeric, milk thistle, greater burdock, lavender, marshmallow, rosehip. Have you used Acana Singles Free-Run Duck Dog before? Let us know what you think about this product.